The Grand Forks Motor Inn is located on highway #3, (2729 Central Avenue). 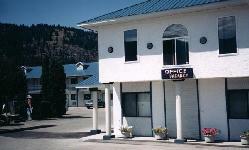 The motel has been extensively renovated and is in excellent condition. 47 Rooms - air conditioned. Recreational activities in the area include, snowmobiling, skiing, golfing, hiking, fishing, boating, water skiing, raft racing, rock hounding and gold panning.